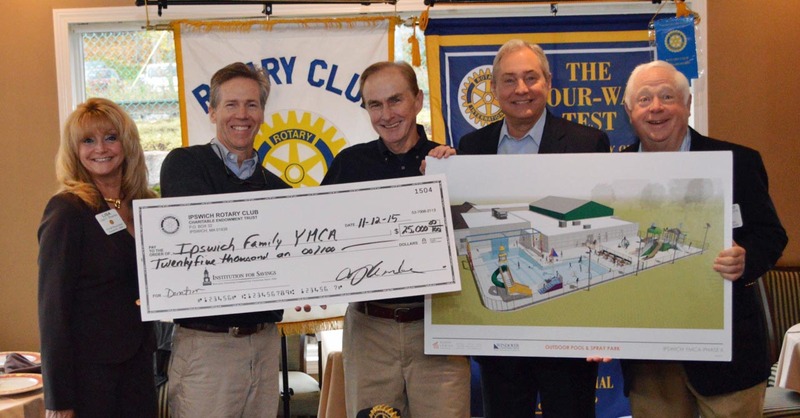 Ipswich Rotary is supporting the Ipswich YMCA expansion with a donation of $25,000. The Ipswich Family Y serves residents of Ipswich and Rowley, towns also served by Ipswich Rotary, plus Essex, Hamilton and Wenham. The Ipswich Rotary Club has a long history of partnership with the local YMCA. In addition to supporting the initial construction, the club built adjacent Rotary Park in 2004-05 as part of its celebration of the 100th anniversary of Rotary International. The park, which includes a baseball field, gazebo and open space, has become an important feature of the Y complex, especially during summer camp months. In recent years Rotarians have enhanced the park with new millstone signage and a bench dedicated to the memory of one of the park’s founders, Rotarian Bud Conley. In 2013, the Rotary sponsored Ipswich High School Interact club placed one of five international Peace Poles at the park entrance as part of their annual community service outreach. In the photo, Gerry Beauchamp, Ipswich YMCA Executive Director and an Ipswich Rotary Director, is presented with a check from the club. From left to right are President Elect Lisa Shanko, Immediate Past President Rev. Brad Clark during whose term the grant was initiated, Gerry Beauchamp, Vice President Cushing Titcomb, and President Bob Gravino.